This paper presents a semi-automatic method for tracking the mitral valve leaflet in transesophageal echocardiography. The algorithm requires a manual initialization and then segments an image sequence. The use of two constrained active contours and curve fitting techniques results in a fast segmentation algorithm. The active contours successfully track the inner cardiac muscle and the mitral valve leaflet axis. Three sequences have been processed and the generated muscle outline and leaflet axis have been visually assessed by an expert. 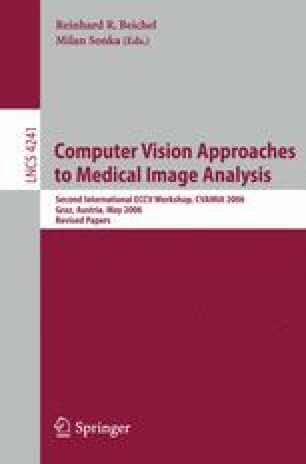 This work is a part of a more general project which aims at providing real-time detection of the mitral valve leaflet in transesophageal echocardiography images.